Aficionados of timeless beauty, cross your fingers. With a little bit of luck, this angel will become the next top junior plus-size model. It may not happen--indeed, given the results of similar scenarios in the past, it is likely not to happen--but hope springs eternal . . . The results of Tyra Banks's "Fiercely Real" modelling competition are being revealed over two episodes of the Tyra show, airing today and tomorrow, and while the search has yielded predictably disappointing results size-wise, it might yet redeem itself. Today's episode opened with shots of several of the girls who were not selected to be among the six finalists. Despite Tyra's affirmative voice-over praising their "juicy, beautiful, round, double-digit-size selves," and despite the fact that the contest was nominally open to girls size 12-20, the larger girls were rejected. The only sizes admitted on the show were a 12, a 14, and a 14/15. We have a hard time believing that there weren't any candidates over a size 16 who weren't more attractive than at least some of the contestants who appeared on the show. But be that as it may, plus-size beauty still has a chance in this competition, because among the finalists was a girl named Caralyn who is without a doubt one of the loveliest models we have ever seen. Sadly, she is only a size 12. But as the images in this post will show, she possesses a soft, curvaceous figure and a non-Amazonian height, which offers the possibility that she may someday blossom into a truly full-figured goddess. As she entered, she struck a marvellous look-at-me pose. She was one of only two contestants to go sleeveless, and her top revealed that she possesses soft, round limbs. Her facial features are classically flawless, exhibiting a round shape, and are distinguished by feminine softness. Caralyn next provided a bit of personal history. "I was in the 'in' crowd," she recounted. "I was with all the cool kids," before she parted ways with that group over their use of drugs and alcohol. Both revelations earn her great acclaim. It is highly encouraging to know that a full-figured girl can be a member of the archetypal popular-girl clique (a group that can be found at every high school in North America), and not a stereotypical outcast. Caralyn's beauty undoubtedly earned her this privilege. It also speaks well of her that she was principled enough to break with that crowd when their influence threatened to turn negative. Although her top was not form-fitting, it was a perfect shade to set off her fair complexion. 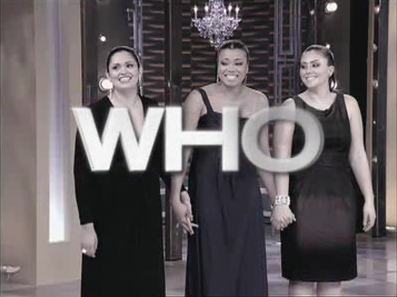 After the competitors made their introductions, Tyra listed the three celebrity judges for the contest, among them the Cycle 10 winner of America's Next Top Model, Whitney Thompson. How unexpected it is to see Whitney in blonde again. We always adored her in this hair colour, but preferred the hairstyles that she wore on ANTM. The first shoot of the competition, photographed by Nigel Barker, was set in a unappealing location, and burdened by unremarkable wardrobe. Nevertheless, the outfit suggested Caralyn's curves, and the model herself did a splendid job at the shoot. A pulled-back hairstyle is always a regrettable choice, but for this the model can hardly be faulted. She posed like a professional, flashing a variety of compelling looks. When asked to assess her own performance, Caralyn displayed some delightful and justified vanity, saying, "I knew it was my time to shine, and I rocked it." This self-assured quality is crucial in plus-size models. They need to possess a tremendous degree of self-satisfaction, even self-adoration, in order to be able to project those exciting qualities in their pictures. Caralyn's time as a member of her school's popular "in crowd" obviously serves her well as a model. As the girls were lined up for their assessments, fans noted another extremely appealing quality about Caralyn: she has a more natural, non-Amazonian height than the other contestants. This benefits her considerably, helping her size-12 figure appear curvier. The judges took turns critiquing each contestant's photographs. Whitney, alas, wasn't assigned to assess Caralyn's performance, but she gave an excellent analysis of a different model's work. Whitney is very animated when she offers picture assessments, and her comments are articulate, insightful, and helpfully critical without being negative. She makes an excellent judge, and would be a fine panel member on America's Next Top Model. When Caralyn was brought out, she first had to answer for the fact that she had been a tad catty about the other girls during the shoot. Her reaction was utterly adorable--more playful than abashed. One has the sense that, throughout her life, her doll-like, angelic appearance has enabled her to get away with considerable mischief--and rightly so, for who could ever discipline such an enchanting beauty? Caralyn has a healthy radiance about her, and her loveliness earned vociferous praise from the judges. Wilhelmina agent Jon Ilani raved about her "beautiful face, very serene," and affirmed, "I think that her face is soft and beautiful." How encouraging to hear a modelling agent praising a face for its feminine softness, thus departing from the modern mindset that valorizes harsh, androgynous faces with ugly, "chiselled" angles. Tyra praised Caralyn as well, noting, "I think the camera absolutely adores your face. Your cheekbones are absolutely gorgeous." The effusive praise made even the charmingly vain Caralyn blush--but secretly, one suspects that she knows that she deserves such attention, and more. Caralyn's photograph turned out to be as good as any picture could be, giving the limitations of the setting, wardrobe, and hairstyle. (Her appearance in panel provided a much better sense of her look.) Note what the agent referred to as her "serene" expression. A reverse shot provided a good sense of the appealing length of the Caralyn's tresses. while this still indicates the soft fullness of her arms. ANTM fans were then treated to several extended shots of Whitney as she critiqued another girl's photos. Some have likened this hairstyle to that of a Three's Company-era Suzanne Sommers. It looked fine on Whitney, even though bangs are generally not flattering. Her beauty makes anything work. Observe that she shares Caralyn's high cheekbones and generally soft features. Even when expressing a touch of displeasure, she still looks gorgeous. 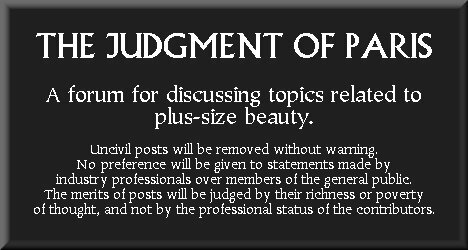 As a judge, she is both entertaining and discerning, and communicates her thoughts in an appealing manner--not leastwise because of her youthful, feminine voice. Fans of plus-size beauty will be sure to tune in tomorrow to see if the beautiful Caralyn wins this competition. Goodness knows that she deserves to do so. What are Caralyn's chances? A preview video for tomorrow's Tyra episode indicates that at the very least she will be in the final three. It also shows her participating in an intriguing photo shoot that will showcase her lovely tresses and precocious posing ability. The plus-size industry has a marvellous opportunity to sign a truly beautiful talent. Will it capitalize on this girl's potential? We will have to wait and see; but based on past experience, we caution our readers not to get their hopes up. The industry has a dismal history of letting its brightest stars slip away. Be sure to click on the link below to see an excerpts video from today's episode, showing Whitney's appealing turn as a modelling judge, and Caralyn's memorable modelling debut. Last edited by HSG : 9th March 2010 at 04:13. Caralyn is very beautiful, but I'm really disappointed that the finalists were all close to the same size. Since the contest was open to girls size 12 to 20, the finalists should have ranged from size 12 to 20, not all of them being at the smallest end. That's so wrong, for all kinds of reasons. I love Tyra for staging this, but she had a real opportunity to push the envelope and introduce fuller plus-size models. I loved Emme's recent Rachel Ray episode targeting sizes 20+. I wish someone could put the two approaches together: something geared toward teens, like Tyra's angle, but accommodating larger sizes, like Emme's. Caralyn next provided a bit of personal history. "I was in the 'in' crowd," she recounted. "I was with all the cool kids,"
Caralyn's time as a member of her school's popular "in crowd" obviously serves her well as a model. That's an interesting point. I think fashion sometimes gets so caught up in its "edgy" "outsider" identity that it forgets that there are a lot of mainstream curvy girls who just want to feel good about themselves. Models with accessible, pretty looks really appeal to them. Actually, both Caralyn and Whitney both have that "popular girl" vibe. Whitney really had it on ANTM, with all the talk of her resembling a cheerleader. It's an attractive quality. 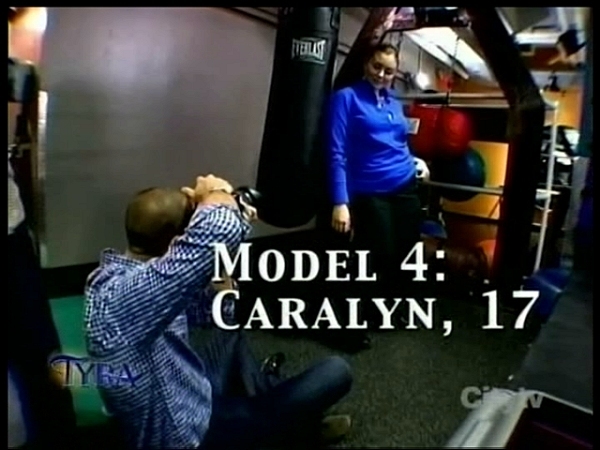 I hope Caralyn wins, but I wish she were fuller figured, at least a size 14.
based on past experience, we caution our readers not to get their hopes up. The industry has a dismal history of letting its brightest stars slip away. Sure enough. Caralyn was the 1st runner-up. It was sad, really, because she very obviously should have won, as she demonstrably had the strongest pictures. The girl who was given the nod wouldn't even have been my fourth pick, let alone higher than that. Terrible choice. At the end, you could tell that there was a split among the judges, and my instinct is that Ann Shoket (the Seventeen editor) and Whitney were pulling for Caralyn, while the agent went the other way. Another disappointment. An upstate New York magazine called Block Club just ran a short interview with Caralyn in its latest issue, and included a series of photographs of the model that indicate how gorgeous she really is. I love this picture, in which she displays a bit of the adorable "spoiled princess" quality that was evident in the show. The hair is to die for. A bit more gentle and demure here. Very attractive top - one that she wore in the second episode of the Fiercely Real contest. She SO deserved to win! Look at how attractive she is. I wish she were a bit fuller, but I appreciate the fact that she isnt overly toned, but has a natural physique.